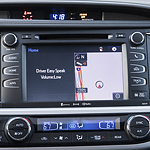 When you get behind the wheel of a brand-new Toyota, you will be treated to the company's newest multimedia features. This technological system is called Entune. It features six speakers, which create a surround-sound experience when you listen to music. Those speakers capture every note of the song, including the deepest bass tunes. When you are traveling to a new place, take advantage of the Scout GPS link. This GPS gives you detailed directions so that you do not miss a turn, lane change or curve in the road. It gets you to where you need to go, and it offers up-to-date information that takes road closures into account. At Capitol Toyota, we invite you to stop by and take one of the Toyota models with Entune technology out on a test drive in Salem today.